Life on Earth as we know it wouldn’t be possible without the magnetic field protecting our planet. But research shows it is weakening fast. In the coming centuries, Earth’s magnetic field is expected to go through unprecedented changes. And we are only just starting to understand this vital force of nature and its puzzling behavior. In the absence of a magnetic field, these charged particles would strip away the ozone layer, which protects the Earth from harmful ultraviolet rays. Vital but invisible, this magnetic field can be seen on rare occasions when the solar particles collude with gas molecules, resulting in what’s known as auroras. Many living organisms – from bacteria to insects or fish – seem to rely on Earth’s magnetic field to navigate. Man has been doing that for a thousand years since the invention of the compass. Ship logs reveal historic records of Earth’s magnetic evolution. With the magnetic north constantly moving, navy and merchant fleets had to regularly update their maps. Ground-based observatories were built to keep track of the changes, leading to the scientific study of the magnetic field. There are around one hundred observatories monitoring the Earth’s magnetic field, like this one in Brorfelde in Denmark. Precisely calibrated magnetometers measure and record changes in the magnetic field across continents and islands. But ground observatories only cover parts of the ocean, leaving blank spots on geomagnetic maps. That problem can be solved by putting the magnetometers into orbit. 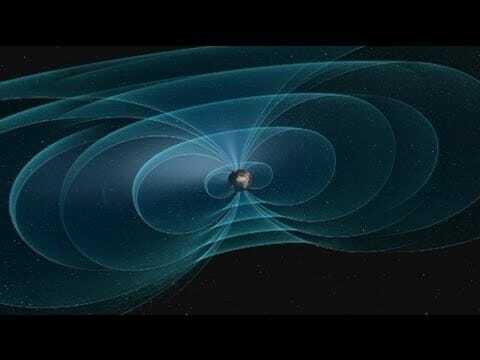 From space, satellites can accurately measure the magnitude and the direction of the magnetic field anywhere on Earth. Magnetometers built by the engineers at the Danish National Space Institute are built using induction coil sensors. Danish space scientists launched their first orbital magnetometer in 1999. Data gathered by the Oersted satellite, which is still operational today, confirms that the magnetic poles are moving increasingly fast. The satellite’s measuring instruments are hosted on an eight-meter long boom. A soon-to-be-launched mission by the European Space Agency is due to take a much deeper look at the Earth’s magnetic field. Made up of a constellation of three identical satellites, the aim of the mission is to gather data both on the field’s composition AND its evolution in space and time. Two Swarm satellites will orbit close together at the same altitude, while the third will fly higher. The spherical magnetometers onboard will provide new data on the Earth’s electromagnetic process – both beneath and above the surface of our planet. The satellites have been specially designed to withstand the test of time: their mission life is estimated to last at least four years. It’s hoped the new data will help understand why the Earth’s shield is fading. Some scientists believe it could be a sign of a magnetic pole flip – not an uncommon occurrence in the history of our planet. Such an event hasn’t occurred for almost 800 thousand years. Each reversal takes thousands of years or so to complete. It’s hard to predict how it would affect life on our planet without better understanding all the components shaping Earth’s magnetic field. Carefully assembled and calibrated, the three satelites – each weighing almost half a ton – are ready to be sent into space. Lift-off is expected in the first half of 2013. Swarm will back up the European Space Agency’s fleet of Earth Explorers which focus on better understanding changes that occur on our planet. Without its magnetic shield, Earth would probably resemble Venus or Mars, which are defenseless against the Sun’s deadly radiation. Better understanding the magnetosphere is an essential part of global surveillance, and the Swarm mission may shed some light on possible links between solar activity and climate variations. The GOCE satellite, for instance, has gathered enough data to provide the most accurate map ever of Earth’s gravity. This map will not only help scientists better address the impact of climate change but it also offers new clues about the dynamics of the planet’s core. Two other Earth Explorer satellites, CryoSat and SMOS, are taking a deeper look into the volume of polar ice. By accurately measuring the change in ice thickness, CryoSat should help better understand the role ice plays in the Earth system. The mission has produced the first high-resolution map of its kind reflecting a rapid change of this sensitive ecosystem: measurements show Arctic ice is thinning fast. Backed up by ground validation, all this observation data helps improve our understanding of Earth’s changing environment… and our role in it. While Earth Explorers not only help Man better understand the planet he lives live on, they also play a major role in better assessing the impact of human activity on global change.